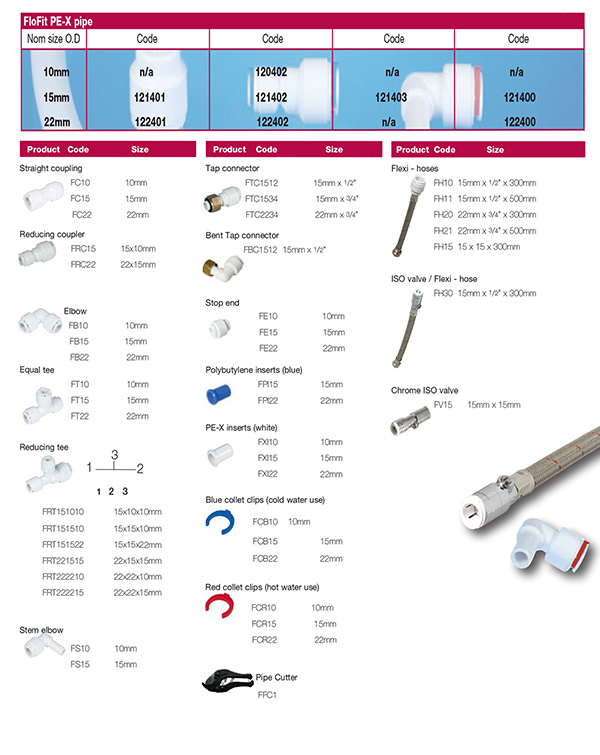 FloFit is a flexible and fully demountable push-fit plumbing system. The product is suitable for all domestic and small commercial hot & cold-water installations, including central heating for both pressurised (un-vented) and combi (vented) systems. FloFit enables the installer to undertake a faster, easier and more cost effective installation. Independent testing confirms time savings of up to 40% compared with traditional plumbing materials. Pipe flexibility aids installation and cabling through awkward, confined and less accessible areas. The risk of fire generated by the use of blowtorches is removed. Reduced costs through quicker installation and the use of multi-length pipes. Less noise from expansion and contraction caused by water flow. Good thermal resistance to freezing conditions.